i've been getting a lot of judy garland comments recently. in the past two weeks, i've had friends say that i look very judy garland-esque or parisian. i think it has something to do with my new bomber jacket...yeah, that's it. and to top it off, i've heard "somewhere over the rainbow" like a million times since then, including when i went shopping at victoria's secret, and i even had to sing it in my voice class. it was the weirdest thing. so i think judy must be speaking to me through the grave. 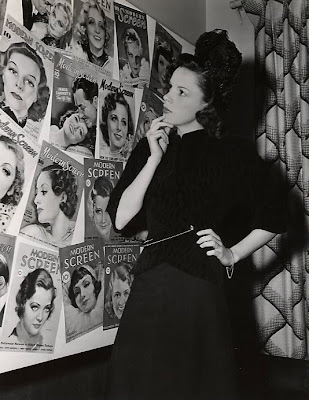 on that note, i've decided to post some great photos of judy and her style. who has your favorite old-school style? i love love parisian and the 1920-40's!!! and you DO look like her its in the lips!!!!! Love your cocktail dress! Very fashionable. :) Love the side bow. Judy Garland is awesome and sooo talented! i love vintage pictures! judy is so beautiful! for now, i love colbie caillat's old-school style. she's always so effortlessly chic! her hair is always so marvelous. i love her style. cute dress. You're hair looks so pretty and retro. Did you go somewhere special? I don't think I can recognize Judy Garland unless I'm watching Wizard of Oz or if I see a picture of her as Dorothy. I should get start getting into watching old movies and getting to know classic Hollywood starlets. They're so inspiring. I didn't think I like the side bow that much at first, but you looked amazing. Aaah,About 'Somewhere over the rainbow"-- it was freaky to see your post named that,cause recently I got tagged in an album like that. and i jjst adore your dress so much! 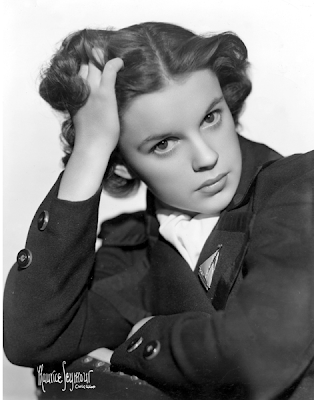 I lovelovelove Judy Garland - I wanted to be her when I was little! She has such a gorgeous face and was so talented. I also really like Rita Hayworth, I wish stars of that era were still around. You look amazing. Your cocktail dress is beautiful. I loved Dorothy when I eas little! Love your dress, especially the colour! Thanks for your comment, pls come back soon! Maybe Judy is your muse or someone you want to embody/follow style wise. Like Gap did with Audrey Hepburn and the skinny pants. I've heard that once you're aware of something new it tends to follow you, the only scenario I can think of for me, is when I learn like a new term of phrase and it seems like all of a sudden everyones saying it. And this cocktail dress is amazing. It’s almost iridescent. i love your cocktail dress very cute! Love your dress! And Judy is just amazing - I'd be very happy if people likened me to her! Hi gorgeous- I'm Loving this!! Love Judy... she has such a heartbreaking life story, too. I am an Edie Sedgwick fan. Great blog, I am a writer as well! those old pics are fabulous!!! she's gorgeous. and i love your jacket!